I've selected 1 photo from each month of 2013 and here's December. Here's Paige winning first place on floor at her home meet, The Christmas City Classic in Bethlehem. The calendar's turned to 2014, and as my Mom says: "Here we go again." I've selected 1 photo from each month of 2013 and here's November. 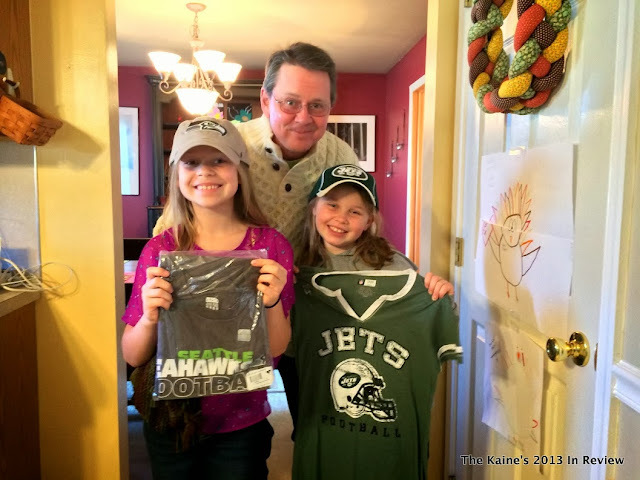 Here's Uncle Joel giving the girls their NFL watching gear. Sunday's with Joel are the best days! I've selected 1 photo from each month of 2013 and here's October. 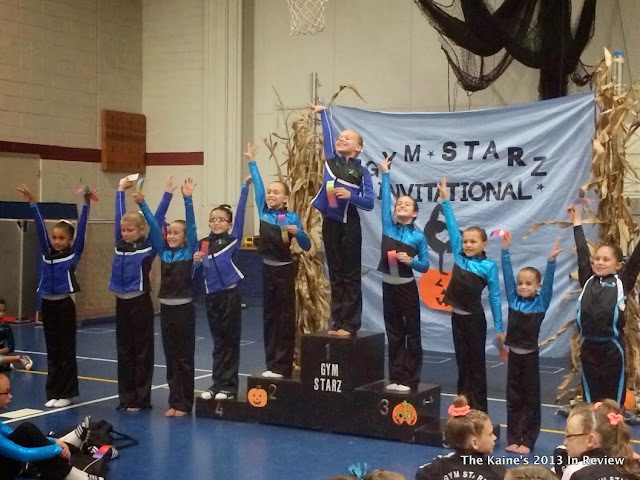 Paige won first place on beam at Gym Starz Invitational in Sunbury, PA! I've selected 1 photo from each month of 2013 and here's September. Here's Kaitlyn playing some killer field hockey at one of her last games of the season. She's a force to be reckoned with! I've selected 1 photo from each month of 2013 and here's August. Our favorite trip of the year to Maine. This is on Isle Au Haut just after we landed from the ferry. I called it "Isle of Hell", but that's for another day. I've selected 1 photo from each month of 2013 and here's July. We brought home my 3rd daughter, Ginger, to the family! I've selected 1 photo from each month of 2013 and here's June. We are on the way to my niece, Mary Ann and Dan's, wedding. A beautiful event! I've selected 1 photo from each month of 2013 and here's May. We decided to take a trip to Ringing Rocks State Park about an hour from our house. We made a video too! I've selected 1 photo from each month of 2013 and here's April. Kaitlyn and I headed off to a dinner-date and dancing at her Girl Scout Daddy/Daughter Dance. I've selected 1 photo from each month of 2013 and here's March. Paige winning first on beam in Columbus, Ohio at the Arnold Festival. I've selected 1 photo from each month of 2013 and here's February: Kaitlyn's first time picking up a lacrosse stick at the Pocono Dome. She had a fantastic first year and little did I know I'd be coaching her team that year to an undefeated season! I've selected 1 photo from each month of 2013 and here's January. Remember Tim Tebow?